our 2016 Winner’s Choice Giveaway. get you a 25% cash reward. Heroes Certified Real Estate Program to contact you? *The Heroes Certified Real Estate Program rebate may be limited by State or Federal law and is not available in all states. Contact your Heroes Certified representative for more information. Contact your tax professional as customer is responsible for any taxes due on rebate. Heroes Certified is a New Jersey licensed real estate broker located at 114 W. Main St., Clinton, New Jersey 08809. 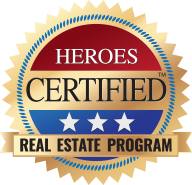 Heroes Certified is not directly affiliated with any realtors featured on this page or our website. Services limited to referring prospects. If your home is listed with another broker, please disregard this offer. It is not our intention to solicit the offers of other brokers. All information deemed reliable but not guaranteed and should be independently verified. Heroes Certified is a trademark of Belsito Communications, Inc. Copyright 2015 Belsito Communications, Inc. All rights reserved. • Your Contact Information. This includes your name, address, phone number, e- mail, and details you provide to us about you. • Web Usage. Heroes Mortgage uses Google Analytics, which tracks and manages cookie information so that we and third-party service providers can better deliver advertisements that are relevant and useful to you online, including the Heroes Mortgage website and various other websites across the Internet. We have also implemented Google Analytics display network impression reporting to better understand how ad impressions and ad services are related to visits to our sites. • Your Social Networks. If you use the social networking connection functions offered through Heroes Mortgage, we may access all of your social network profile information that you have made available to be shared with us. • Your Payment Information (for Affiliates and other third party service providers). If necessary to secure payment from you, Heroes Mortgage will collect your credit/debit card information. This information is secured using industry- standard encryption technology. Heroes Mortgage will use this information to complete your order, and will not share this information with outside parties, except to the extent necessary to complete the order or comply with applicable law as detailed below. Heroes Mortgage will never attempt to collect payment or payment information from a hero interested in using Heroes Mortgage. There is no cost to a hero for using the Services. Use of Information - Generally speaking, Heroes Mortgage will use information collected from you to provide you with the Services and to improve the Services. You thus acknowledge and agree that Heroes Mortgage may use information collected from you for the following purposes. • Communications with You. Heroes Mortgage will use your e-mail address to communicate with you as necessary, including providing you with information you have requested or confirming that you will receive the Services. If you do not wish to receive e-mails from Heroes Mortgage, send an e-mail to support@HeroesMortgage.com. • You ask us to share the information. If you request that Heroes Mortgage contacts a third party on your behalf, then you are consenting to disclosure of information and, particularly, personal contact information and any information we collect through your use of the Heroes Mortgage website. For example, if you choose to contact a lender through the Services, we will send your contact information to the lender. • Heroes Mortgage needs to disclose the information to provide the Services. Heroes Mortgage may hire or contract with a service provider or business partner to operate some part or all of Heroes Mortgage's business or provide better services to you. In order to provide the Services to you, Heroes Mortgage may allow a third party to access information. Heroes Mortgage will only disclose the information necessary for the service provider or business partner to perform the Services. • Heroes Mortgage affiliates with a different company or sells its business. Heroes Mortgage may share information with any company or companies that affiliate with Heroes Mortgage, including business partners. If Heroes Mortgage ;is involved in a merger, acquisition, or any form of transfer or sale of some or all of its business, whether as a going concern or as part of bankruptcy, liquidation, or similar proceeding. Information may be transferred along with the business. Any company with whom Heroes Mortgage affiliates or partners with has their own privacy and consumer information policies and, potentially, additional laws with which they must comply. Heroes Mortgage is not responsible for ensuring compliance by other individuals, companies, or business partners. • Heroes Mortgage is required by law to disclose information. Heroes Mortgage may disclose any information in response to a subpoena or court order, and whenever Heroes Mortgage has a good faith belief that access, use, preservation or disclosure of the information is reasonably necessary to (a) satisfy any requirement of law, regulation, legal process, or enforceable governmental request, (b) detect, prevent, or otherwise respond to fraud, security or technical concerns, (c) support auditing and compliance functions, or (d) protect the rights, property, or safety of the public against harm. Heroes Mortgage Efforts to Secure Information. Heroes Mortgage uses technical and physical safeguards to protect against foreseeable breaches of its data, including the unauthorized use, access, or destruction of any information subject to this policy. No Social Security number needed to get started. Committed to helping get you the home financing you deserve. Heroes Mortgage serves the selfless, hard working men and women who serve us. Paid or volunteer, active or retired, we respect you for the sacrifices you make to keep our lives richer and safer. Our participating lenders are committed to offering an array of outstanding benefits and unsurpassed customer service. A strong commitment to lending to heroes like you will make the process of obtaining a mortgage or refinancing smoother, while saving you money. We work only with bankers who are dedicated to serving you in your best interest. how to satisfy all your needs in a respectful, professional manner. "During the course of my mortgage, issues arose with the property that might have dismantled the entire process. Thanks to the Heroes Program they were able to figure out a solution in time for my closing. They were just so helpful and made everything so much easier. To find out about the Heroes Mortgage Program was a blessing for me. To save that money, was great... It helped me so much"
“To save that kind of money is a big deal, and the process was very straightforward. There were no catches. It was well thought out and very streamlined. It was to the point and I’m glad I found out about (Heroes Mortgage Program). I’ve been very fortunate in my career because of my background as a volunteer firefighter and experience in EMS an rescue."